The maiden flight was from Berlin to Kyiv. The Irish low-cost airline Ryanair started operating in Ukraine on 3 September. Its first flight from Berlin Schoenefeld landed at Kyiv Boryspil airport at 2.25 p.m. local time. The airline will make four flights a week: on Monday, Wednesday, Friday and Sunday. Kyiv-Berlin is one of 12 itineraries the airline will be offering during the autumn-winter season. Ryanair first announced its plans to come to Ukraine on 15 March 2017. However, the first negotiations with Kyiv Boryspil airport failed and the company cancelled its plans. The Ukrainian government intervened and the negotiations resumed. 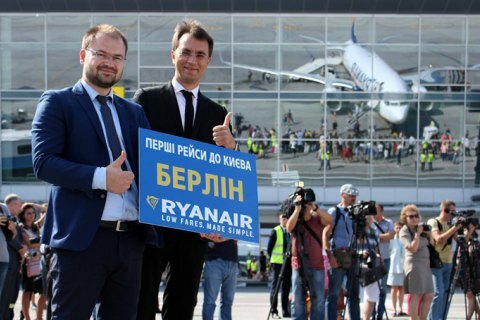 On 23 March 2018, Ryanair signed an agreement with the airports in Kyiv and Lviv.